Line Array Calculator (LAC) is a simulation software intended for the design and prediction of JBL VTX Line Array systems and their acoustical performance. In addition, you can also use the software with flown and ground stacked JBL VTX Subwoofer Arrays. Beyond just acoustical prediction, you can use Line Array Calculator for mechanical validation and the calculation of all weight limits and safety warnings for JBL VTX Systems. Line Array Calculator’s Enhanced Acoustical Modeling includes color SPL mapping, 0dB Isobar and SPL attenuation modes with frequency response and SPL based on JBL’s VTX DSP presets. With it, you can place up to 8 virtual microphones in the venue for accurate position-dependent response prediction. Additionally, the built-in Calculator is now updated with subwoofer modeling, allowing you to generate subwoofer delay values for electronic subwoofer array steering (EDS). Mechanical Validation of single and dual-point array suspensions can now include weight limit calculations in real time. Array statistics are calculated that include array size, depth and weight and array design factors are calculated, that you can use to design arrays that meet local safety and regulation limits. Safety warning messages can also be provided when an unsafe configuration is selected. 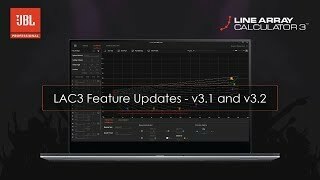 Updates found in the new Line Array Calculator 3.2.1 include: a completely redesigned UI that’s both more intuitive and combined with an unlimited number of planes; more virtual measurement probes; frequency response averaging of multiple virtual measurements; and a brand-new subwoofer prediction mode. Multiple subwoofer clusters can now be entered into the display window and the software will predict broadband polar response of the entire array. With Line Array Calculator 3.2.1, system designers can now make more informed decisions about how subwoofer arrays should be placed in venues and aid in the optimization of these arrays for their best possible performance. JBL Array Link is a mobile companion app that works in conjunction with JBL’s latest LAC-III software to assist technicians deploying JBL VTX Series line array systems. Array Link uses a QR code system to transfer all array mechanical information from the main LAC-III application to a mobile phone – this transfer is done directly and in real time without the need of internet connection. All relevant rigging information and options are presented in an easy-to-understand layout. The application is compatible with iOS® and Android and can be obtained from the respective App Stores. Offering accurate predictions in an efficient and time-conscious manner, the JBL Line Array Calculator platform supports all VTX line array products and is a critical link in the system design and prediction process. Added a subwoofer spacing selection in the Application Options menu. Subwoofer spacing can be defined as "Center to Center" or "Edge to Edge"